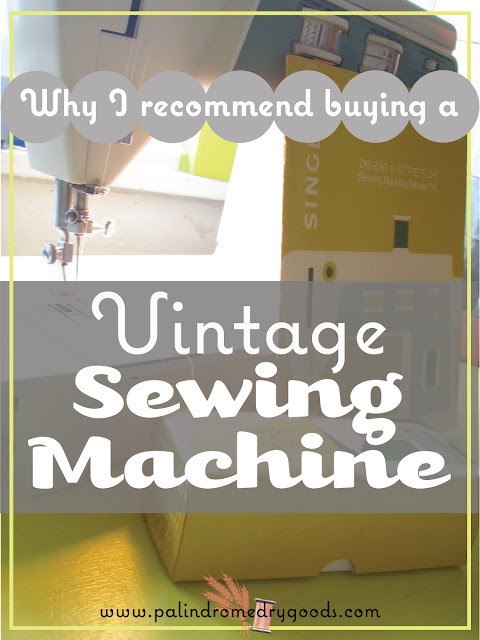 When I taught sewing lessons at The Tin Thimble I always recommended that my students purchase a vintage sewing machine and they usually seemed surprised. Today, I'd like to share with you why I love older machines so much and what to look for when you purchase one. As always, feel free to comment below with questions! Firstly, what qualifies as 'vintage'? Well there is some general disagreement out there about that, but for this post specifically, I mean machines made from the 1980's and older. I also recommend all models. Kenmore, Singer, Necchi, Brother, White, Viking, Janome. It doesn't matter. I've worked with all those (and more I didn't list) and have had success with all of them. I wrote an entire post on cleaning, oiling and maintaining your sewing machine. Unfortunately, for many of my readers with brand new sewing machines, this post will not be helpful to them. Many new sewing machines do not allow us to take them apart and service them ourselves. This is because they have fancy computers inside that we would risk damaging if we poked around. Older machines can be opened up, taken apart, cleaned, oiled, and put back together with a fair amount of ease. This means we can save ourselves some cash by foregoing services at our local sew-n-vac place and do it ourselves! 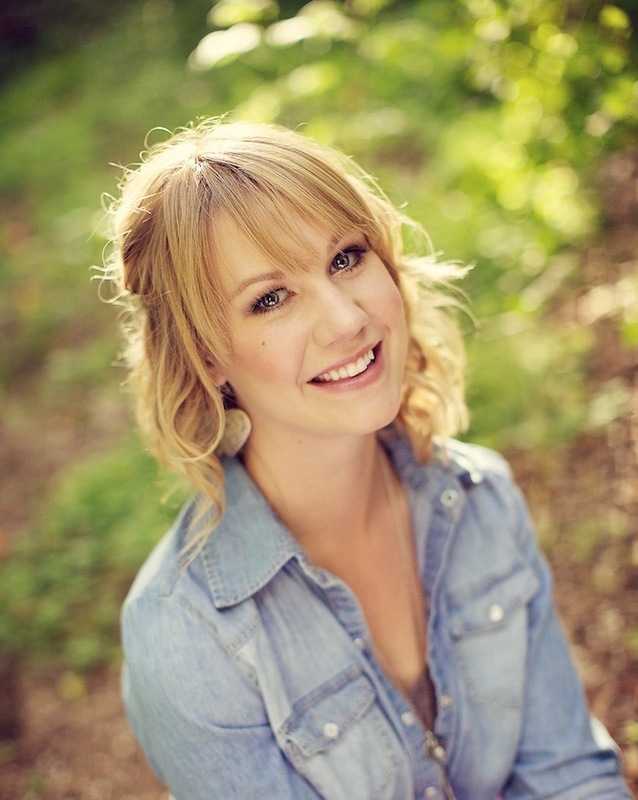 Plastic has many benefits, but it is not a material I want to find in my sewing machine. Plastic melts. Plastic bends. Plastic cracks. Vintage sewing machines are made almost entirely of metal, which means they are difficult to break. It also means that they are sturdier than their newer, plastic models. They can push through more layers of heavy fabric (hello, denim and canvas! ), and they will produce lovely, even, stitches through these layers because they're so tough. Basically, they're much harder to break than new, plastic, machines, which means we don't have to be afraid of damaging them. Also, side note, you can find many brands that were made in America. That is nearly impossible today. That $40 Singer at Target is definitely made in China. Personally, I'm all for American made. There is beauty in simplicity. Vintage sewing machines often have a limited number of stitches such as straight, zig zag, buttonhole, overlock and perhaps a few more. For beginning seamstresses, this is perfect. For more advanced garment seamstresses, this is perfect. If you want to machine quilt a king-sized quilt with machine embroidery stitches, this is not perfect. If you've explored this little blog of mine at all, you have seen my portfolio of sewing projects. I never wish that I had a serger (uh, wayyy too many spools of thread happening there), or that I had a selection of 45 decorative stitches. I am pleased as punch with my small selection of useful, but aesthetically pleasing, stitches. I love my vintage machine because it is a workhorse. It gets the job done every time, and with beautiful results. It is not fussy, it is not hard to fix, it does not have computer glitches. The sewing machine that I use for daily sewing, currently, is a 1980's Necchi that I purchased at Goodwill for $15. It's been six years since I purchased it and I've only taken it twice to be professionally serviced. Thrift stores are a fantastic place to look for these little vintage honeys. You can also find them easily on Craigslist and at yard sales. They're rarely overpriced and there's often nothing wrong with them. 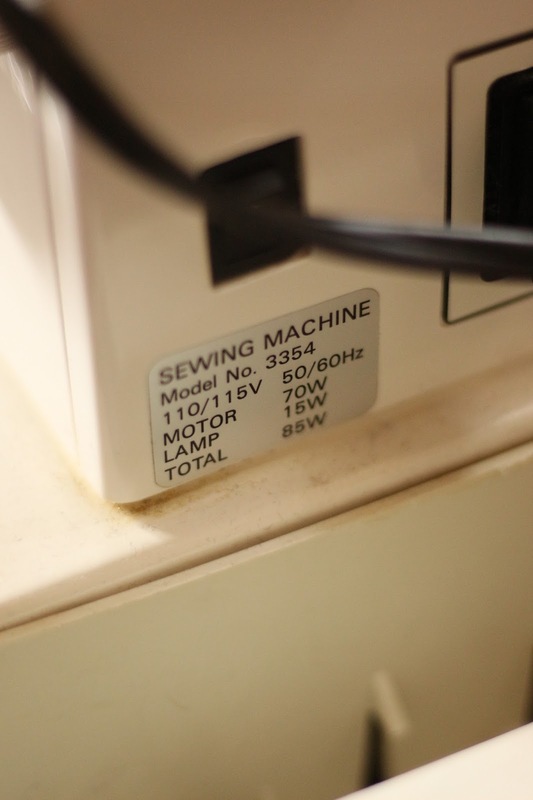 You may only pay $30 for a sewing machine that will last you your entire lifetime. Find the number plate. There should be a metal plate located either on the side, back or underside of the machine. Here you'll find the model number, serial number, and the watts/amps/energy amounts for the machine. If you're able, do a quick internet search for the model number and see what comes up. If there are other machines like it for sale, that's a good sign. That means it will be easier to find replacement parts and attachments. If nothing like it shows up, it may be a collectors item! But this also means that parts and attachments will be more difficult to find. Are there reviews for it on Ebay or any other websites? Do sewists like it? Does it move? If you turn the hand wheel, do the parts in the machine move through their motions? Does the needle go up and down? If so, that's a really good sign. Better yet, if it has the power cord, and you're able to plug it in, try it out! It may sound bad, but that's ok. Any weird smells or sounds the machine produces are likely from lack of use, dust build up, dried grease, etc. Those problems can be fixed with a thorough tune-up (which you can do yourself, remember?). If it won't budge at all, you may want to pass it up (although I have seen several frozen machines be restored to their original beauty through a lot of patient oiling and cleaning...just sayin'). Does it have all it's parts? Machine, power cord, pedal, attachments. These are the main components of the sewing machine (the attachments being the least important part). If it doesn't have the power cord or the pedal, you may want to take a moment to see if you can find one on Ebay or Etsy. If you have a Sew-n-Vac place in your town, you could call them to see if they carry, or can order, replacement parts for older machines. If it doesn't have the attachments, don't worry, those are also easily discovered with a quick internet search. Does it have the manual? Yes? Score! No? That's ok! Just about every sewing machine manual can be found in either a physical copy, or a digital copy online. If you're searching for a 1950's or older manual, I highly recommend searching Ebay and Etsy. If you're searching for a newer manual, some are available as free digital downloads simply by Googling them. 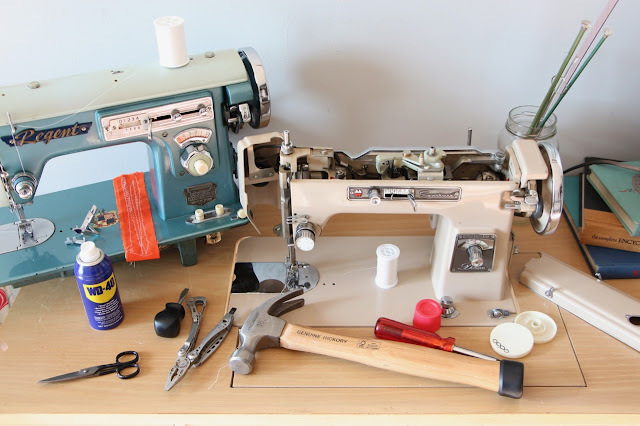 If you purchase a machine that needs a bit of TLC, be sure to check out my post on how to restore vintage sewing machines! If you have further questions about purchasing a vintage sewing machine, please comment below! I'd love to help you figure out what type of machine is right for you. I am a beginner and got lucky buying a 1990s Bernina 153qe. I am interested in older machines and thought I might use one for heavier fabrics. How do you recommend adding an older machine with an already pretty reliable one? Set uo for button holes, or other specialty stitching? Hello Iris! Thank you for commenting. I've had a student or two bring in a Bernina 153 qe, they are very nice machines. 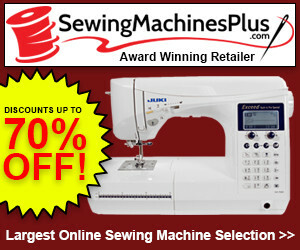 Whether or not you should purchase an additional, older, machine really comes down to what type of sewing you do. Do you mostly quilt? What types of fabrics do you use, cottons, denims, silks, etc? The Bernina you have is an excellent machine for light to mid weight cottons and most quilting applications. It probably makes a beautiful automatic buttonhole (with the attachment) through two or three layers of quilting-weight cotton. If you sew often with heavy fabrics (denim, canvas, large wale corduroy, thick wool, etc.) a second, older, machine would definitely be helpful. My mom, for example, sews daily on a 1990's Pfaff, but when it comes time to sew straps onto her denim overalls, or handles onto canvas purses, she uses a 1940's Pfaff (that looks like a piece of military equipment!) because it is extremely durable, and makes beautiful stitches through all those heavy layers. Additionally, these older machines are often great for repair work. I can sew the frayed edges of my bath mat just fine, where as a new machine might struggle through such a thick layer. This applies to repairs on winter jackets, pillows, jeans, blankets, curtains, and my fiance's (heavy and awkward) work clothing to name a few. I hope this helps answer your questions. You have a lovely machine and as long as you only plan on sewing lightweight fabrics, or several layers of cotton, it should be more than suitable for your sewing needs.